On seeing Paul Matson’s re-interpretation of the series of the first three posters, I thought I’d add an extract from my PhD thesis (please reference me if you quote… I have noticed phrasings very similar to my thesis surrounding this story, mostly collated from my original research). It was great to hear last week that my PhD thesis is being digitised by the British Library (which only happens if there is enough demand to read it! )… not surprising though as it’s an interesting subject! Added in 2017: likely artist for the poster designs is Ernest Wallcousins, although the slogan itself is still up for debate. For more information on the numbers, read here. The first half of the chapter has been added here. Extract from PhD thesis. © Rebecca Lewis, 2004 Please note that this information is COPYRIGHTED, so please reference this URL, or the thesis itself. The Second World War was often perceived as a classless ‘People’s War’ because, regardless of any prevailing inequality and exploitation, ‘the nation is always conceived as a deep, horizontal comradeship’. Propaganda was needed to appeal to the masses, including a reasoned appeal that would ‘show the extent to which every man and woman is a participant in the war’, and the importance of a combined team effort. Although it was ‘impossible to foresee’ what conditions would prevail during the first weeks of war, it was felt necessary to prepare for the worst. The MOI was to assume that the public would be subjected to an appalling series of shocks, resulting in shattered nerves, a lack of confidence in ultimate success, and therefore a lack of will to work for victory. It was expected that there would be ‘an imperative need for a copious issue of general reassurance material’, particularly in the early months of the war, which would be the sole responsibility of the MOI. Disregarding Leeper’s conviction that it was impossible to prepare effective propaganda in advance, the government started planning for the first posters in earnest in early 1939. By mid-June 1939 the first poster-roughs were ready for inspection. In April 1939, members of the HPC were asked to come up with a selection of slogans and motifs from which to build poster designs. The first posters were to ‘stand out strikingly from among the numerous posters which would be issued by other Departments’. Posters were to ‘bear a distinctive uniform device’, making it ‘difficult or impossible for the enemy to print reproductions’. Pictorial distinction was to be achieved by using leading artists whose work would be associated with the MOI; typographical distinction by the use of a ‘special and handsome type’. Initial designs were to include a message ‘from the King to his people’. It was decided that the message should ‘go out as far as possible in the form in which the King himself would send it’, but using fine type rather than imitation typescript. Rather than a photograph, a crown would head the poster. Sir William Codling, suggesting a short, single-sheet message, prepared suggestions in a suitable format. Later in the war, it was recognised that the nation was ‘constituted through shared and anonymous suffering and heroism’, and thus the booklet Front Line, produced by the MOI in 1942 contained only one quote from Churchill, and no pictures of royalty. The above poster was to be accompanied by a ‘reassurance poster’, which would ‘steady the people and assure them that all necessary measures to defend England’ had been taken. The aims for the first poster were ambitious. It was agreed that the first poster slogan, supported by the pictorial design, should if possible: ‘attract immediate attention and evoke a spontaneous reaction’; ‘exert a steadying influence’; ‘incite to action’; ‘harmonise with general preconceived ideas among the public’; ‘be short’; and ‘be universal in appeal’. The initial poster was to stress ‘an attitude of mind’, rather than an aim, as it was assumed that the public would appreciate the issues involved at the start of war. Nicolson advocated that the initial ‘dignified design’ should be supplemented by a poster with a ‘more colloquial appeal’, such as one ‘incorporating a historical progression from the medieval English bowman to the typical modern citizen.’ Posters would also include a ‘statement of the duty of the individual citizen’, which would be non-pictorial and in more than one colour, and a poster warning against enemy propaganda. Although experts were consulted for slogans, the slogan for the first poster was suggested by Waterfield, a career civil servant. Concerned that posters along the lines of ‘Keep Steady’ were uninspiring, and implied that the nation was on the defensive, Waterfield called for ‘a rallying war-cry that will bring out the best in everyone of us and put us in an offensive mood at once’. He suggested three ideas: a play on Kitchener (figure 2), with ‘Your King and Country need you all’, appealing not just to the men to fight, but to ‘every man, woman and child’. Second, he suggested that it was the will of the nation that would win or lose the war, and suggested ‘Your Courage, Your Cheerfulness, Your Resolution will Bring us Victory’. Third, he felt there was a need for a reminder that it is the task of the nation to destroy Nazism and everything it stood for. Waterfield did not believe that he had the wording right on any of these, but favoured the last. As production could take a ‘considerable time’, designs were to be printed, and distributed regionally, in advance, ‘so that, when necessary, the posters could be placarded throughout the country with a minimum of delay’. The initial posters were expected to be of ‘an exceptional size’, and to be ‘displayed on more than ordinarily extensive sites’, such as the sides of buildings, such as figure 61. It was planned that HMSO would be responsible for the printing of posters, and that an advertising concern would be called on to arrange for the display of posters after they had been printed. Mr Surrey Dane and Mr Huxley were responsible for work on the first posters, and agreed to secure the services of artists capable of doing quick roughs for poster designs. It was agreed that the poster art-work should be of a high standard, at least equal to, or better than, the highest commercial standard, but that it should make an essentially popular appeal. Posters were expected to be displayed for eight weeks at a time. Original plans were to commission five designs, with expert advisors pressing for immediate printing for all five, a valid ‘insurance premium in view of the immensity of the risk’. The Ministry, concerned that this ‘might involve considerable waste in view of possible changes of policy’, was ‘content’ to ask for authority to print from only one design. The proviso was that another four designs were commissioned immediately, rather than waiting for the start of hostilities, as they were unsure ‘how quickly suitable designs’ could be produced under wartime conditions. As was good commercial practice, the first poster was to be in six colours. Anticipated costs for the first poster were £20,600 for printing, packing and storing five million posters, and £225 for the design. Figures were prepared by Surrey Dane of Odham’s Press, on the Publicity Planning Committee of the Ministry, and were largely accepted by HMSO as reasonable. Fees to artists for design needed to allow for accepted roughs and finished art work, adaptation to different sizes and proportions, including reproportioning of lettering. Commissioned roughs needed to be paid for even if ‘not accepted for the finished design’. A significant number of extra posters were required for ‘renewals’ for outdoor display in order to keep sites in good order. Surrey Dane worked in consultation with Benson’s preparing estimates for costs, for the nation-wide campaign, to include Wales and Northern Ireland. It was expected that the MOI should pay in the normal way for sites, but seek preferential rates as was usual for large orders. Estimates were prepared according to traditional commercial costs, although it was anticipated that prices could fall on the outbreak of war. Both voluntary sites and commercial sites were categorised. The posters, once printed, were ‘parcelled and stored in London ready for immediate dispatch to local distribution centres’ at an appropriate time in the emergency period. Posters were to be distributed in bulk ready for local distribution: commercial sites through Bensons, railway platform sites, old EMB sites, newsagents boards, Office of Works, Ministry of Labour, local authorities, LPTB Underground and buses and trolley buses, from 15” x 10” to 48-sheet sizes. Smaller amounts, from 15” x 10” to 16-sheet sizes were to be distributed to the GPO, schools, cinemas, works, co-operative societies, hotels, public houses and builders. Posters sized 15” x 10” to double crown, were provided to banks, van sides, shop windows and interiors, places of worship, National Savings Committee, hospitals and clinics, and 50,000 of a special design for display in empty and wrecked houses. It was calculated that, once the sites were secured, and the finished posters delivered to Benson’s, a nation-wide display could be effected by that firm within twenty-four hours. Voluntary, non-commercial sites were considered important, particularly in rural areas, where commercial sites did not cover. These sites included shops and shop-windows; government and municipal buildings; village halls, women’s institutes and private houses. Posters on these sites would be standardised to crown and double crown sizes. The danger of such sites was the juxtaposition of official publicity posters with other miscellaneous posters, ‘detracting from the effect of the former’. Although in general the largest site was most effective, small posters outside the newsagents’ shops below eye level attracted special notice people were used to reading such placards all the time in order to get news. The poster with a proclamation from the King was to be ‘plastered everywhere in order to drive the contents into everyone’s head’. By August 1939 war was regarded as inevitable, and by 9 August the finished drawings were submitted to Macadam for final approval. Any adaptations to proportions would then be made and the posters printed. By 23 August the proportions to be printed were decided. The percentages were: ‘Freedom is in Peril’ (for remote areas), 12% (figure 22); ‘Keep Calm and Carry on’, 65%; and ‘Your Courage, etc.’, 23% (figure 1). The Treasury had approved costs for a single poster, three designs were produced, exceeding estimates by under £50. “Our Fighting Men Depend on You” for factories, works, docks and harbours, was also printed, for which no allowance had originally been made. By September, ‘Your Courage’ and ‘Freedom is in Peril’ were already being posted throughout the country. 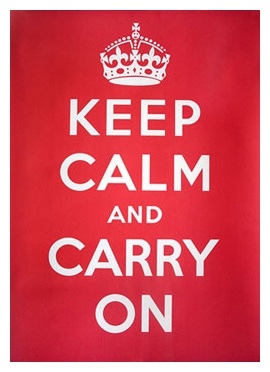 ‘Keep Calm and Carry on’ was printed and held in reserve for when the necessity arose, for example, a severe air-raid, although it was never actually displayed. Soon after war was declared, the small poster ‘Don’t Help the Enemy, Careless Talk may give away vital secrets’ (figure 62) was approved by the War Office and was ready to put into production. 58,000 copies had already been distributed by September 17, and 75,000 copies were to be despatched daily from September 26. By the end of September 1939, roughs for further designs had been prepared and approved, including messages from the King and the Queen, designs specifically for factories and docks, and designs specifically for each branch of the armed services: reassurance, not recruiting, posters. Coverage is extensive in the archives on the first few posters produced by the MOI, and so also receives much subsequent historical comment, much of it negative. Mass-Observation (M-O) had been asked by the MOI, on September 26 1939, to ‘report on the red Government Posters and their effects, in general; to report on dissatisfaction with the posters and the reasons for them in particular’. On October 1 1939 MOI said that it could no longer use outside agencies, but M-O decided to complete the work, following the original terms of reference, believing that the work was essential. Working without financial or official support, M-O observers worked without authority, and ‘against the difficulty of spy-fear’. The ‘Your Courage’ poster was remembered by several questionnaire respondents, although no other early posters were mentioned. They were seen in the window of the Butcher’s shop in Eastleigh, ‘on the way to school or work in Winchester’, in the engineering works, and believed to be the result of a political speech. The poster was clearly remembered from Barnstaple in Devon, when, as a schoolboy, his ‘home town… blossomed with crimson posters’. He remembered that ‘these posters were much maligned’, although the reason was unclear. A journalist from the Daily Mail was critical of the ‘Your Courage’ slogan for being too complex, passing the poster six times every day, he was still unable to precisely remember the slogan. Someone from the Ministry of Health, critical of the HPD as responsible for the ‘Your Courage’ posters, believed that it was run by people ‘full of vague ideas’, with little ‘practical experience in the conduct of publicity campaigns’. Within the M-O survey, ‘Your Courage’ was the second most-mentioned remembered slogan, and nearly all comment was disparaging. The message had been impacted by sheer repetition but whether it had been remembered in the right spirit was questionable: it still existed everywhere, and was deemed mostly annoying and inappropriate for the wartime situation. The wording of ‘Your Courage… will bring us victory’ was criticised. There was some evidence the combination of ‘your’ and ‘us’ ‘suggested to many people that they were being encouraged to work for someone else’, with the ‘your’ referring to the civilian, the ‘us’ to the Government. It was pointed out that the slogan ‘Your King and Country needs you’ had avoided such a defect and in future, more care should be taken to avoid slogans that disassociated the civilian from the government. ‘Freedom is in Peril’ was also deemed ineffective, blamed on ‘the abstractness of the words, not one of which had any popular appeal’. Even during the planning stages the criticism had been raised that ‘Freedom’ was rather an abstract concept and was ‘likely to be too academic and too alien to the British habit of thought’. Is it wise, to say the least, to placard the countryside with posters calling on the courage and resolution of the individual when no appreciable demands have yet been made on these qualities? The MOI had expected the nation to have to deal with immediate bombardment, but this did not happen. Once the Phoney War was over, Advertiser’s Weekly noted that the nation had finally arrived at the point of ‘courage, cheerfulness and resolution’. People could finally obey the exhortations of posters that had become all too familiar to ‘us’ over twelve long months. Responsibility for the failure of campaigns was placed squarely with the government as it meant that, either the people had not been made to feel the urgency of the message, or that ‘the leaders have not spoken in a language which the people can understand and respond to’. Beable, the President of London Poster Advertising Association, felt the MOI should be given due credit as well as criticism. They had acted quickly with the posters, working within the necessity for wording and design to be simple for prompt reproduction and quick absorption. The colour scheme (pillar box red and white) was clever in contrast, both attractive and effective. He felt that the poster had succeeded in getting the public ‘war conscious, war energetic, yet war calmly minded’, as it had certainly been noticed by the journalists. Possibly reacting to criticism that they had spent too much money on posters, in October 1939, it was decided to cancel the programme of press advertising and the use of commercial poster sites. Steps were taken to give publicity to the material already prepared, through designs suitable to voluntary poster sites. Original problems for the MOI can be attributed to the instability in the organisation, primarily the result of press criticism. After the original questioning of its role, it appeared largely unremarkable, at the time, that the MOI should have the power to be the central agency for information. The MOI was thoroughly planned, and built upon extensive government and commercial experience. Clear administrative and production processes were instituted, and the importance of using suitable people, to produce the right message at the appropriate time, in the best location, became clearer as war continued. Initially, the MOI transferred the authority of royalty to the propaganda messages. As the war progressed, discourses of royalty were subsumed into discourses of the people’s war, tied in with discourses of citizenship, where ‘shared responsibility for the continuity of the nation remained the most important of these duties’. Democratic, governmental and citizenship discourses clearly emanated from the MOI, with the audience not forced, but subject to self-regulation, although subject-positions were assumed by the MOI. Discourses of the ‘public’ were important, as public opinion was sought in planning and reaction to campaigns. Within the MOI, economic discourses, including those of rationing, played an important part in dictating what was possible. Patriotic discourses were called upon to get artists to contribute, with democratic discourses allowing artists near-autonomy in design, building upon notions that they were the ‘experts’. Anderson, B., Imagined Communities: Reflections on the Origin and Spread of Nationalism, 1991, p.7. PRO INF 1/73, ‘Francis Williams: Theme for Propaganda’, undated but probably 1941. PRO INF 1/299, ‘Ministry of Information O.E.P.E.C., Paper No. 10’, September 7 1938, p.1. Noted in Cruickshank, C., op.cit., 1977, p.16. PRO INF 1/300 follows the development of the first wartime posters from at least April 13 1939. PRO INF 1/720, ‘Meeting, Programme of Publicity Measures’, June 8 1939. Ibid., ‘3rd Meeting, Immediate Programme of Publicity Measures’, April 20 1939. Ibid., ‘Immediate Programme of Home Publicity Measures’, April 13 1939. PRO INF 1/226, ‘Meeting, The Civil Service Commission’, June 27 1939. Matless, D., Landscape and Englishness, 1998, p.185. Ibid., ‘Meeting, Programme of Publicity Measures’, May 4 1939. PRO INF 1/226, ‘Letter from Waterfield to Macadam’, July 17 1939, (emphasis in original). PRO INF 1/720, ‘Immediate Programme of Home Publicity Measures’, April 13 1939. PRO INF 1/299, ‘Ministry of Information O.E.P.E.C., Paper No. 10’, September 7 1938, p.4. PRO INF 1/720, ‘Meeting, Programme of Publicity Measures’, June 29 1939. PRO INF 1/720, ‘Meeting, Programme of Publicity Measures’, undated, but probably June-August 1939. Ibid., ‘12th Meeting, Programme of Publicity Measures’, June 21 1939. PRO INF 1/720, ‘Meeting, Programme of Publicity Measures’, undated but probably June-August 1939. PRO INF 1/261, ‘Memorandum on the report of Mass Observation upon the Red posters’, October 1939. PRO INF 1/10, ‘Functions and Organisation of the Ministry. Memorandum by E.B. Morgan’, early 1939. PRO INF 1/266, ‘Memo from Vaughan to Macadam’, August 9 1939. PRO INF 1/226, ‘Letter from Macadam to W.G.V. Vaughan’, August 23 1939. In the same folder, ‘Demand for Printing Slip for HMSO’, August 31 1939, and ‘Poster Campaign: Distribution’, November 1 1940, give details of the exact quantities ordered on August 31 1939, in a variety of sizes and in both broadside and upright versions, and where distributed. PRO INF 1/302, ‘Summary of Activities of Home Publicity Division’, September 28 1939 notes that all sizes were included, from 20ft. by 10ft. down to 15” x 10”. PRO INF 1/226, ‘Letter from I.S.Macadam, MOI to E.Rowe-Dutton, Treasury’, September 4 1939. PRO INF 1/6, ‘First Report on the Activities of the Ministry of Information from September 3 to September 17 1939’, September 1939. PRO INF 1/302, ‘Summary of Activities of Home Publicity Division’, September 28 1939. PRO INF 1/6, ‘Progress Reports 3 Sept.-11Dec. 1939’, PRO INF 1/226, ‘Printing of Posters’, PRO INF 1/261, ‘Employment of Mass Observation and the British Institute for Public Opinion’, M-O FR2, ‘Government Posters in Wartime’,October 1939, M-O TC 42 – ‘Posters’, Boxes 1, 2 and 4 cover ‘Your Courage; PRO INF 1/6, op.cit., PRO INF 1/226, op.cit., INF 1/261, op.cit., Embleton Scrapbook No. 1 at the IWM, M-O FR 2, op.cit., October 1939; M-O FR 5, ‘Six Railway Posters – Preferences in Design’, October 1939, cover ‘Freedom is in Peril’; PRO INF 1/6, op.cit., PRO INF 2/95, ‘Anti-Gossip Campaign’, M-O TC 42, Box 4/B cover ‘Don’t Help the Enemy’. See also M-O, Change No. 2, Home Propaganda, 1941. Balfour, M., op.cit., 1979, p.57; Chapman, J., op.cit., 1998, p.18; McLaine, I., op.cit., 1979, p.31; and Walton, R. ‘Four in Focus’, in Timmers, M., The Power of the Poster, 1998, p.154, all refer to the ‘failure’ of the first government poster, for various reasons. M-O FR 2, ‘Government Posters in Wartime: Effectiveness of Posters’, October 18 1939, p.1. Female, Hampshire, reply to questionnaire, April 1998. Male, South Shields, reply to questionnaire, March 1998. Male, Buckinghamshire/London, reply to questionnaire, April 1998. (Untitled), Daily Mail, February 7 1940, Embleton Collection, IWM. PRO MH 78/232, ‘Minute Sheet initialled KMG’, September 28 1939. Anonymous, ‘One in Four of Public Remember Govt. Advertising Slogans’, Advertiser’s Weekly, Vol. 107, No. 1,397, February 29 1940, p.156. PRO, INF 1/300, ‘Minutes of meeting held on May 11 1939, of the Home Section of International Propaganda and Broadcasting Enquiry’, May 16 1939, p.8. Press Advertising and the Trade, September 1939 – September 1940, p.35, noted that this was probably a result of the arguments between Fleet Street and the MOI. 351 H.C. DEB. 5s., October 3 1939, Column 1841. Anonymous, ‘M. of I.’s Poster Scheme, through S.H. Benson’s, will cost £44,000. “Daily Express” thinks money would be better spent on arms equipment’, Advertiser’s Weekly, Vol. 105, No. 1,377, October 12 1939, p.26 (emphasis in original). Anonymous, ‘They Say’, Advertiser’s Weekly, Vol. 105, No. 1,378, October 19 1939, p.44. Anonymous, ‘On the Home Front’, Advertiser’s Weekly, Vol. 110, No. 1,438, October 3 1940, p.14. M-O, Change No. 2, Home Propaganda, 1941, p.5. Anonymous, ‘Due Credit to M. of I. For Posters’, Advertiser’s Weekly, Vol. 105, No. 1,377, October 12 1939, p.34, quoting letter to The Times. PRO INF 1/6, ‘Third Report on the MOI, September 25 –October 2 1939’, October 1939. Weight, R. & Beach, A., The Right to Belong: Citizenship and National Identity in Britain, 1930-1960, 1998, p.1. Pingback: ?????????? ?, ?????? ??????????? « ????? ?????? ??????? A very accomplished piece. Materiallst methodology and clear thinking.